It hasn’t been long since I have reviewed a TYLT product, the last being the FLIP-DUO AND THE Y-CHARGE (QUIK). 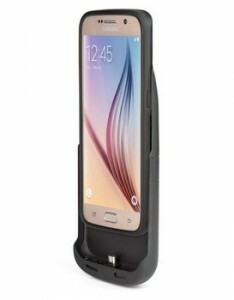 Now I had a chance to review the TYLT ENERGI, made for the Samsung Galaxy S6 and S6 Edge. The purpose of this product is to plug it in to the S6/S6 Edge, and you can slide it in. Then if you need a charge, you just push the button, and this 3,400 mAh battery will give you some juice, cutting you off when you don’t need it. The good thing is that the ENERGI case is Qi compatible, so you can use it on one of those cool wireless chargers like the Powermat and other related products. So, you have protection and power, not to mention the easy of Qi as well. I could find a third that starts with a “p”, but I will recommend the TYLT ENERGI if you have the S6 or S6 Edge. It can be purchased on the TYLT site for about $99.99.